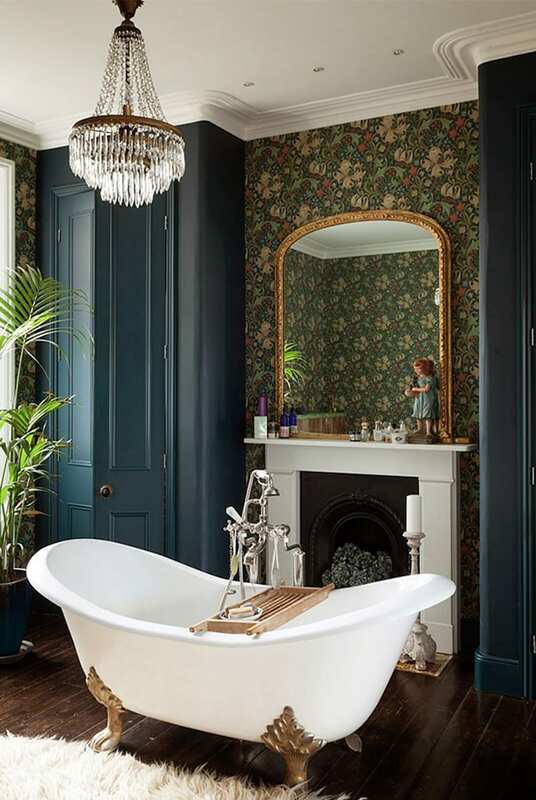 We believe there is a specific approach to bathroom wallpaper if you want a sophisticated finish. For a recent bathroom renovation, we worked on a children’s bathroom with a request to create a feature wall. 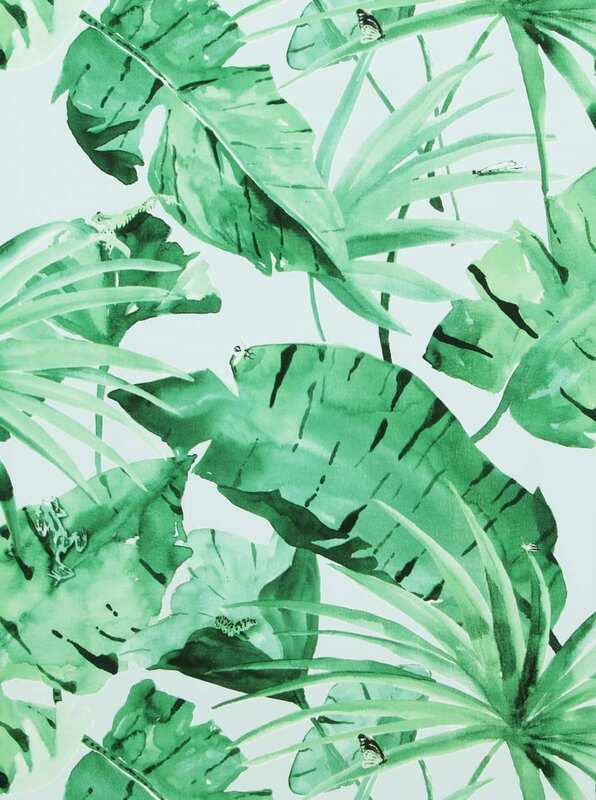 With this in mind, for the bathroom wallpaper, we used palm tree wallpaper to create a statement feature wall and complimented it with a bold colour to achieve a distinctive charm. Today we are looking at five bathrooms that have used wallpaper to achieve a distinctive look. The tropical birds, lush leaves, and grass weave wallpaper by Tektura wallpaper made this an easy decision for our bathroom renovation We used this on the wall opposite the bath because it is suitable for bathrooms. Do keep in mind that the wallpaper is not waterproof, so keep it far from the shower or bath. To minimise the risk of the bathroom wallpaper becoming waterlogged we applied wallpaper suitable adhesives to protect thus ensuring longevity and durability. Most of the time it is the smallest spaces that benefit the most from an innovative touch. 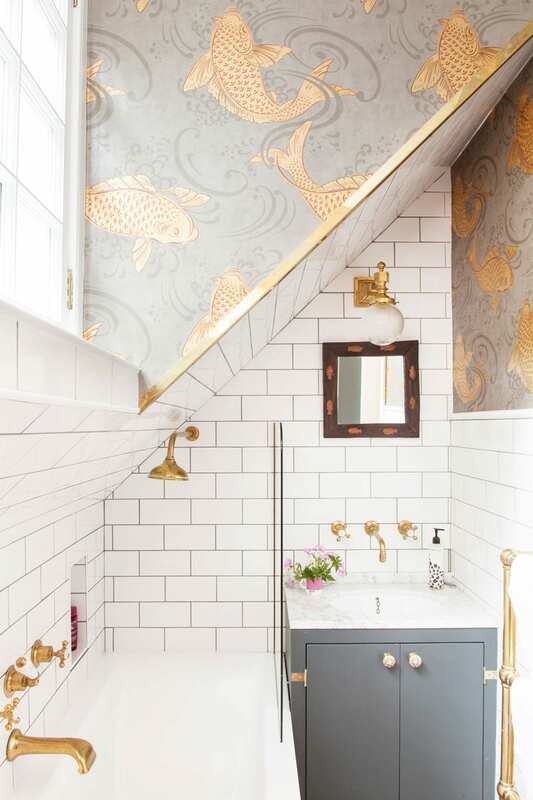 This small bathroom beautifully how angles in the walls can be highlighted beautifully with metallic wallpaper as the highlights draw your eyes up and down the space harmoniously. The brass fittings compliment the wallpaper and the white metro tiles offset the sophisticated grey and brass tones creating a sophisticated scheme. If you have a small bathroom and you want to achieve a statement look opt for a textured looking wallpaper. In this bathroom, an evocative ombré distressed panel stripe has been added to the wall which looks equally effective hung vertically or horizontally. The characterful paper that looks peeling and worn by age is complemented by features and finishes that have a rustic charm. 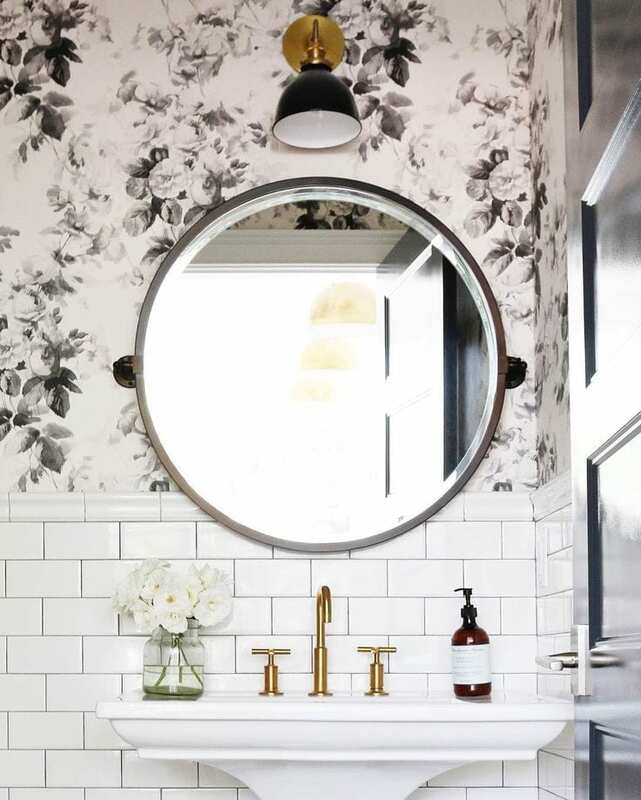 In this small bathroom, the vintage and airy floral wallpaper compliment the space. Elegant vintage-inspired blush tones create a soft look that’s accented by the deeper shades of the leaves. It’s a classically beautiful look with just the right touch of darker colour. We recommend you check with the company you are using to determine how resistant and washable your preferred wallpaper is. Introduce a dense and intricate floral print with a bright golden lily design. If your bathroom naturally offers character with an alcove or cornices, introducing wallpaper is a nice way to highlight such features. This multi-layered approach has the ability to transform your bathroom space into more of a living room space. It is important to make informed decisions when choosing to use wallpaper in unexpected places such as the bathroom. If you have found this post useful and would like to discuss your own bespoke bathroom with a twist, we would love to hear from you. Head to Amberth and a member of our team will be in touch.